Although fresh waters comprise only 0.0093% of the total water on Earth, about 41% of all fishes are primarily or exclusively freshwater inhabitants. This astonishing statistic may be due to the fact that many bodies of fresh water — such as lakes and rivers — are isolated from one another and often develop discrete microhabitats. Both of these factors would favor the development of different species in each body of water and microhabitat. Yet fresh waters seem to be very difficult for modern sharks to invade. 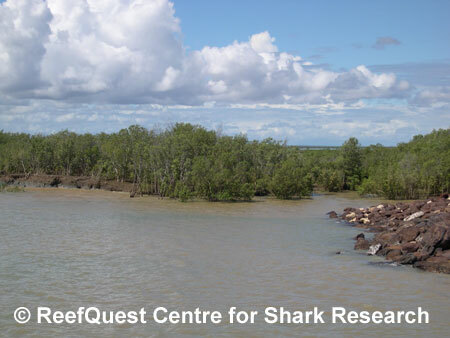 Of some 390 described species of sharks, only about 20 (5%) are known or suspected to invade fresh water habitats and only about 5 (1.25%) are believed to inhabit fresh waters for extended periods. Only the poorly known Ganges River Shark (Glyphis gangeticus) may be an obligate freshwater inhabitant, able to live in sweet water only. Why does freshwater pose such difficulties to sharks? The elegant osmoregulatory mechanism — featuring urea and TMAO retention to increase internal osmotic pressure (‘saltiness’) — that has proven itself so efficient in the sea render fresh waters physiologically inhospitable to sharks. In fresh water, a shark’s ‘salty’ tissues become horribly water-logged through the process of osmosis, forcing its kidneys to work overtime. This is physiologically very taxing and only a few shark species can tolerate — even briefly — the energetic demands of counter-acting the constant influx of fresh water into their tissues. But there is one species that, despite all biological common-sense, is able to move freely between full-strength seawater and completely fresh water.